Ohrdruf Extended: Two Mysteries Solved? 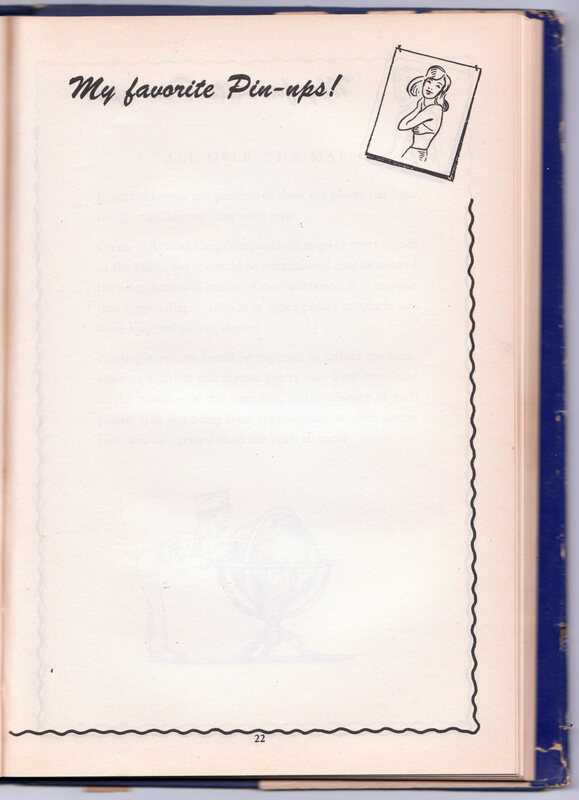 A typical post-war book sold to veterans to write down their experiences. 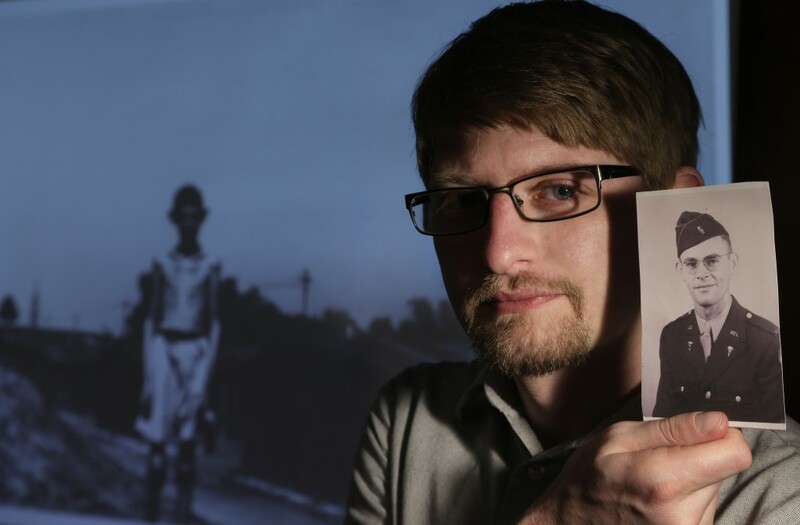 One of the things I wanted to leave people with at the end of “16 Photographs At Ohrdruf” was the idea that uncovering history is possible for anyone. Sometimes it happens when you aren’t expecting it, or when you don’t know how to interpret what you are looking at. Sometimes it happens when you think you already know everything there is to know about a topic. That last version happened to me today while I was boxing up some books and documents from my research for the film. Today I know much more about two small but important-to-my-family mysteries than I did yesterday. Actually, I know more than I ever thought I would… having given up ever finding this kind of information. Neither of these finds are particularly meaningful to history. Yet, I’m posting them here to show what I found and how I was able to interpret it. I guess that’s really the big thing for me, to encourage people to keep and remember these bits that don’t seem to make sense, until an opportunity comes along to make meaning from the chaos. For me it was making the film, but any reason you have makes it worth it. 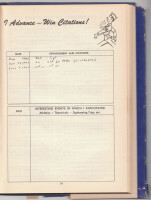 Don’s record of his wartime experience in the 65th Division. 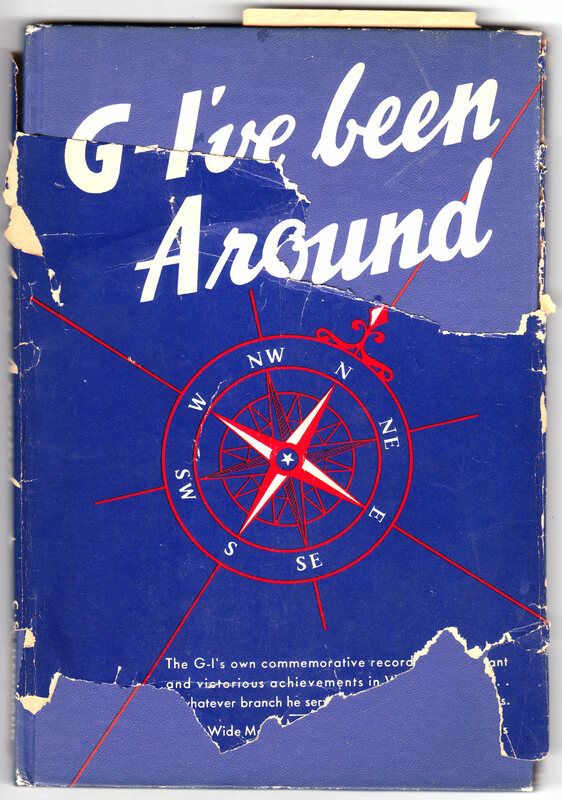 The first discovery was in a book called G-I’ve Been Around which is a sort of post-war diary for returning veterans. 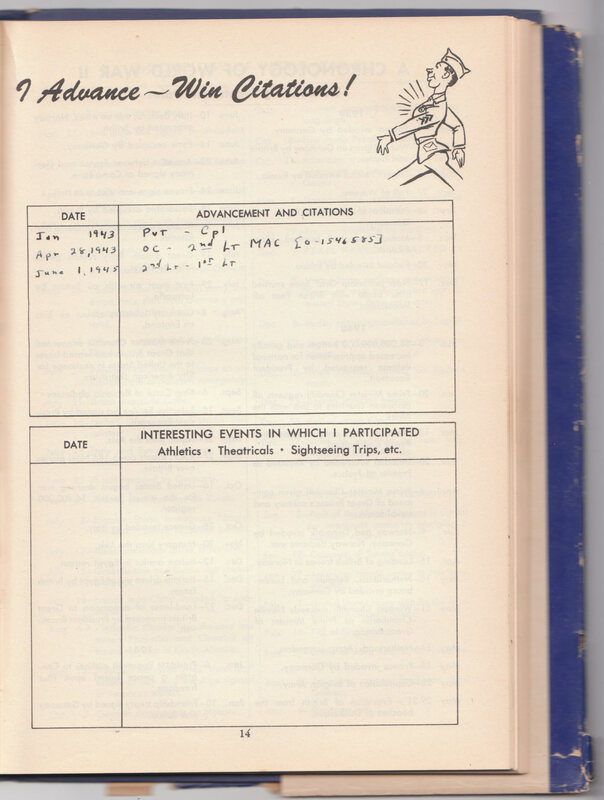 It has pages for recording your experiences, your buddies, your fondest memories, your combat experience. There are color maps of all the continents, oceans, and major belligerent countries so you can mark where you went. There are even spaces to note your favorite song and favorite pin-up girl. Finally! Some dates and serial numbers to help look into his service record! Previously I had ignored this book because when I first thumbed through it the pages seemed empty. Today, however, I noticed that a few sections had been filled in by my grandfather. Actually, only 3 pages had writing so I can be forgiven for having missed them, but I’m really glad I looked one more time. 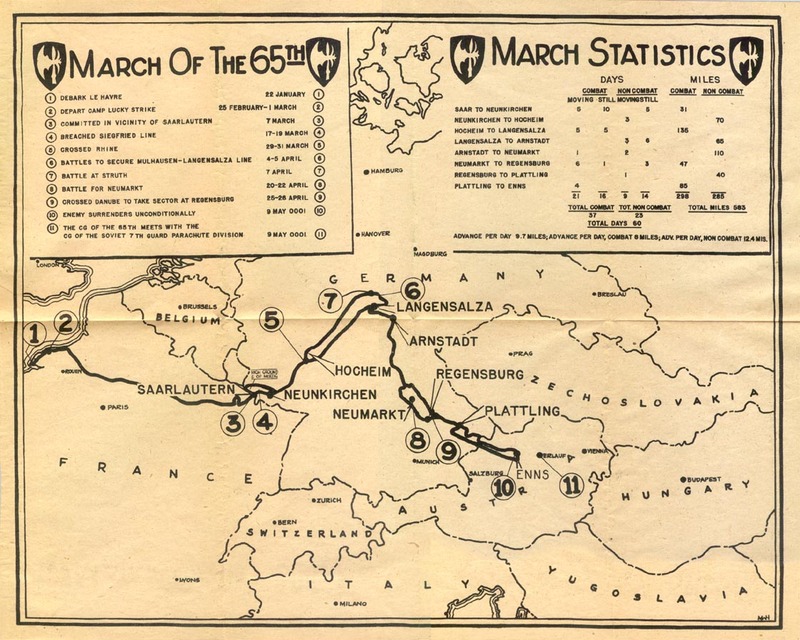 Under his combat experience, he listed a record that matches what I already knew about the 65th Infantry Division — Le Havre to Saarlautern, Arnstadt to Regensburg to Linz. I was not in need of confirmation of his time with the 65th, but it was nice to see it in his own handwriting. All that time overseas and no favorite pin-up? 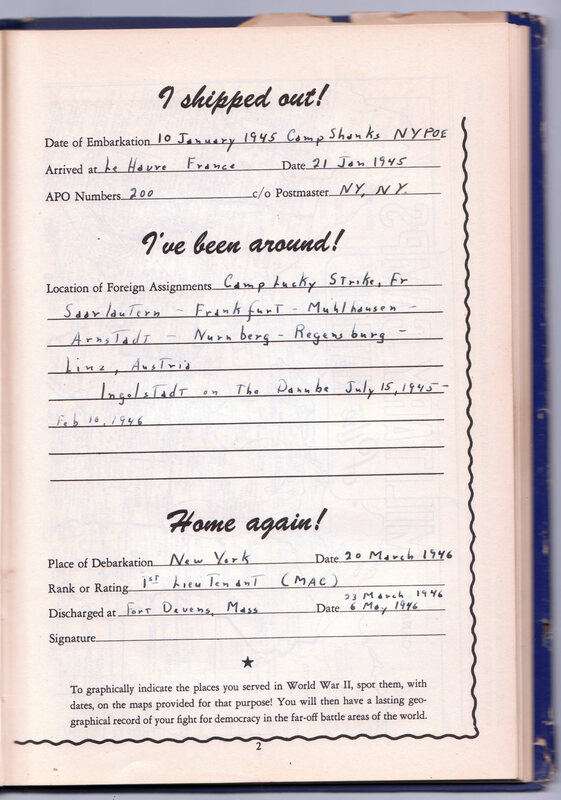 Far more interesting, however, was another page detailing his rank and promotions. This is the first record I’ve found of his induction date, completion of officer training, and what rank he was at the end of the war. No one in the family seems to know any of these dates. Even better, he wrote down his serial number when he was made 2nd Lieutenant, which should help me finally track down his paperwork if it still exists! I know this sounds somewhat trivial, but I’ve spent three years trying to find a guy named Johnson among the millions of soldiers in a war 70 years ago. This is very exciting stuff! 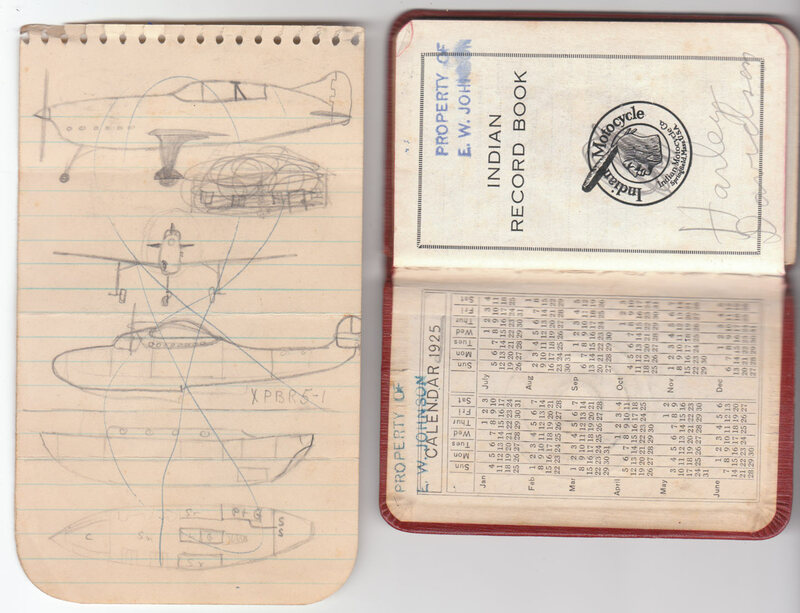 An Indian Motorcycle book from 1925, with some of my great-uncle Warren’s drawings of planes. The second thing I found is not about my grandfather (although it is in his writing) but his brother, Edgar Warren Johnson — my great-uncle Warren. 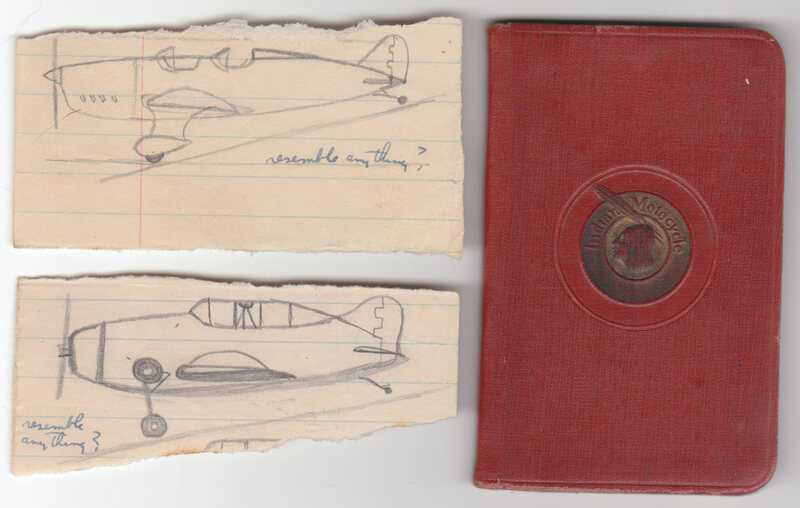 I found this in a crumbling brown-paper folder which I had previously ignored because it is filled with childhood drawings of airplanes and boats, drawn in Warren’s hand. There is a wonderful Indian Motorcycle calendar book from 1925 filled with drawings and writings by my great-uncle that makes me certain the writing on the papers is his. Included in this stack are two pages of typed song lyrics, signed at the bottom by my grandfather Don. 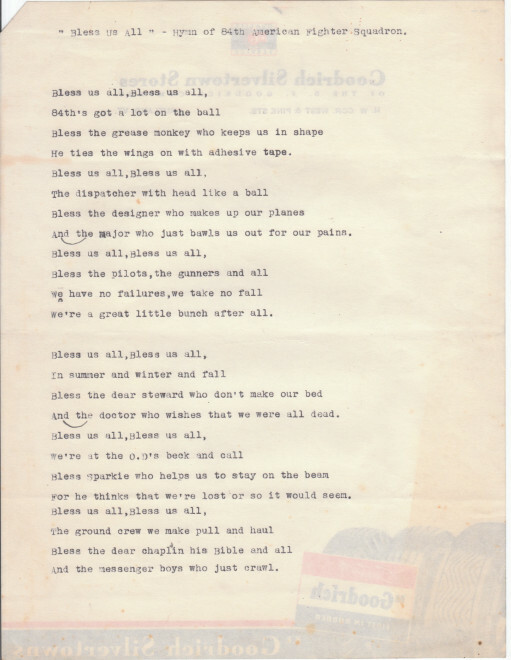 The song is “Bless Us All – Hymn of the 84th American Fighter Squadron” and my grandfather wrote it in 1942. 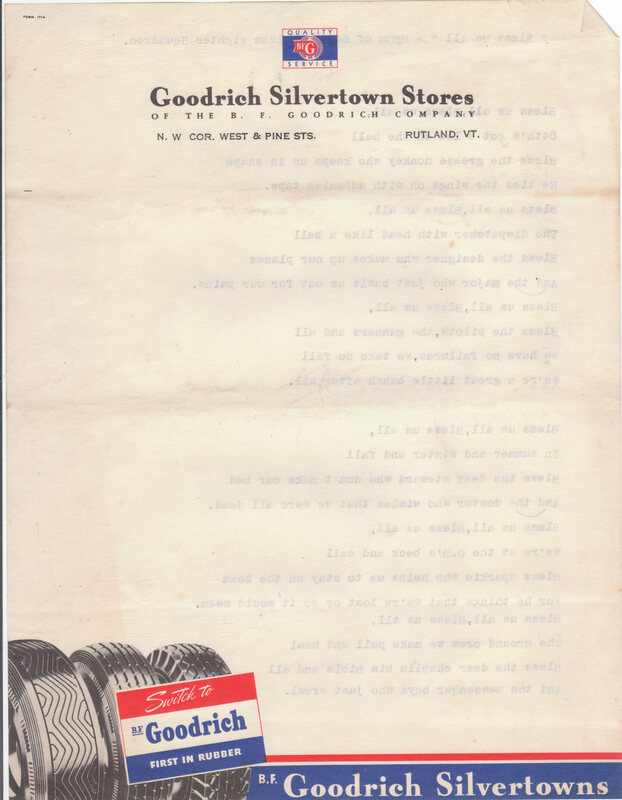 On the reverse side is the amazing letterhead of the Goodrich Silvertowns Store in Rutland, VT. How cool is that!?! 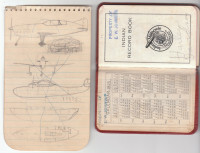 The inside-front-page of the book, and more drawings of planes and a boat from E. Warren Johnson in 1925. Here I need to mention something very important about my great-uncle Warren: he was at Pearl Harbor on December 7th ’41. This was a fact he told everyone who came within earshot, and he mentioned it repeatedly – as if his hat, giant belt buckle and pins weren’t enough to clue you in. It was the defining feature of his life. But…. well, none of us paid too much attention because it was pretty boring stuff, and now that he has passed it’s clear no one remembers much of what he said. Did he work with planes? Was he in the Navy? When did he enlist? Where did he spend the war? Based on the childhood drawings in the envelope, I hope he got to work with planes. My mother sort-of-vaguely remembers that he was in the Army — so he could have been in the Air Corps. 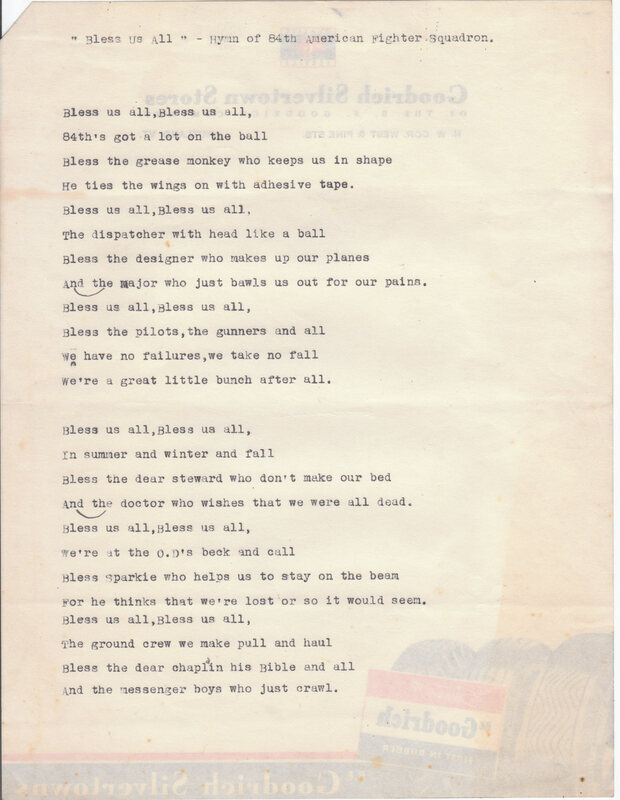 My grandfather, Donald, typed his “Hymn to the 84th American Fighter Squadron” on the back of this letterhead. 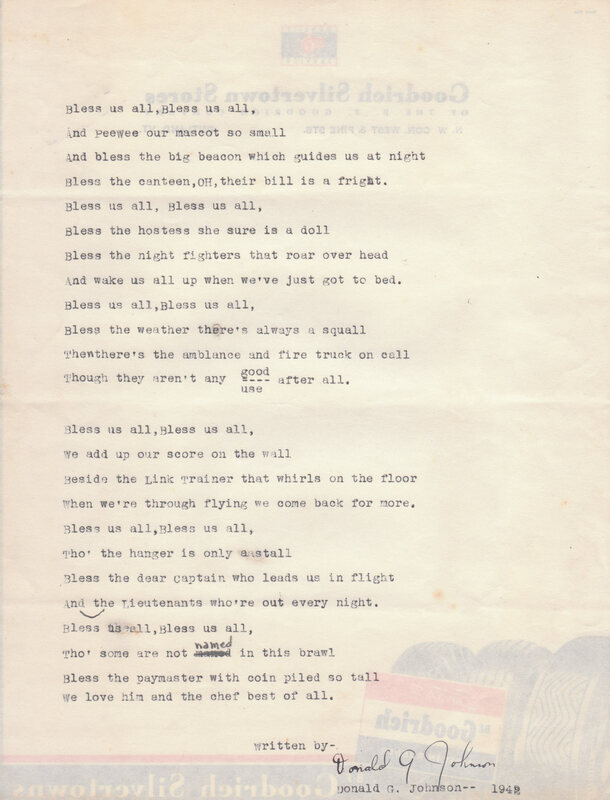 I don’t know for certain that Warren had anything to do with the 84th Fighter Squadron, but why would Don write a song about them in ’42? Did he just pick them out of the blue, or was his brother Warren part of the squad? Or, alternately, was their other brother Bob with the 84th? 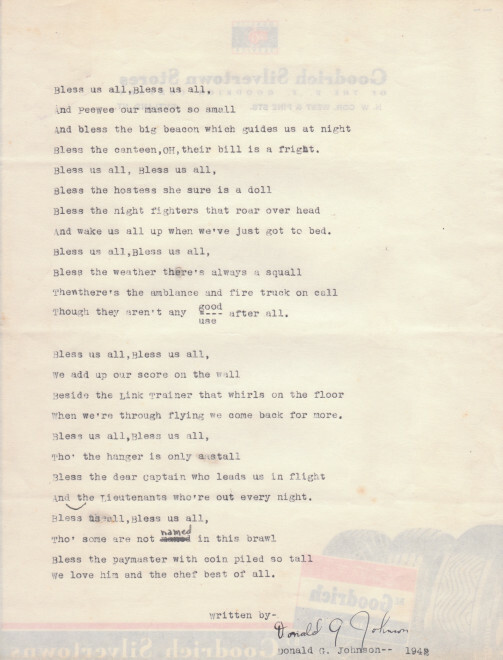 My guess, given that the hymn was included with Warren’s drawings of planes, is that Warren was part of the 84th in 1942. Wikipedia tells me that the 84th Fighter Squadron was activated after Pearl Harbor, so whatever Warren was doing in Hawai’i was not part of that squad, but in ’42 they were a major part of the Allied push into North Africa. 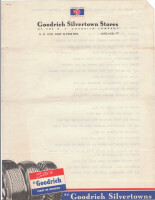 Back in Vermont, youngest brother Don wrote a song for his brother during downtime selling tires and tucked it away with the drawings when he shipped out in January 1943. It’s quite touching, really.